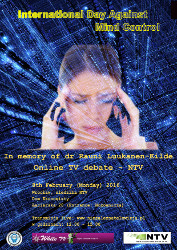 Re-posted, on request, from Mind Control in Deutschland und Europa, who are seeking to disseminate information on a call-in television program in Poland tomorrow, on Feb 8, to raise public awareness of Mind Control (EMF radiation/scalar/sonic) weaponry being used extra-judicially and covertly on citizens in Europe and worldwide, and discuss issues related to Mind Control Harassment, on the occasion of the newly-instituted International Day Against Mind Control, created to honor the anniversary of Dr. Rauni Luukanen-Kilde’s passing. 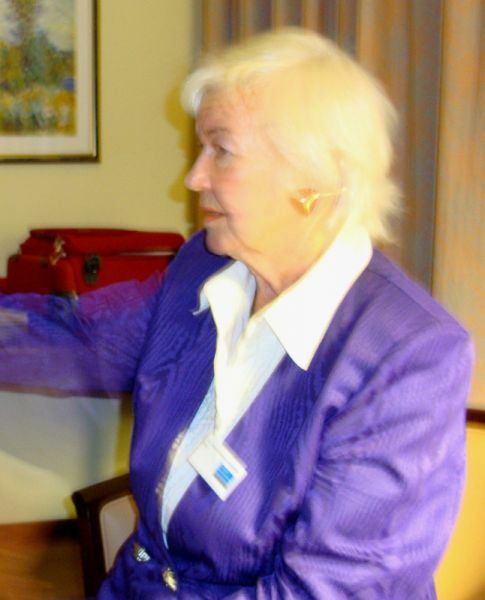 As many know, Dr. Kilde, who was Chief Medical Officer of Finland, was a vocal opponent of Governmental and military mind control programs using Covert Electromagnetic weapons that she learned about in the course of her professional life, researched, authored books on, and took every opportunity to speak widely about. The TV program mentioned below is a joint venture of Swedish WHITE TV and Polish NTV, and will include Skype call-ins, more information below. Dr. Kilde’s December, 2000 essay, posted here earlier, titled Microchip Implants, Mind Control, and Cybernetics traces the history of brain implants, the abuse of neurotechnologies in non-consensual brain experimentation projects being conducted worldwide today by governments and militaries, and warns against the very real and imminent dangers of human robotization implicit in these trends. You can explore her several informative and insightful talks and interviews on Youtube. Dr. Kilde, whose death is attributed to covert assault by Directed-Energy EMF weapons, which she had reported earlier, also spoke and wrote widely on subjects of spirituality, consciousness, and evolution, and was known and loved for her positive outlook, vitality of spirit, and outspokenness. First international day in memory of Rauni Kilde and for TIs worldwide called for Monday, Februay 8th 2016. Polish NTV will send 3 hours special program. National Groups to send victims’ reports. The following message was published by Tomek Bieniek from Poland. As you recall, in Berlin I proposed on behalf of the Polish delegation and the originator, the NTV editor, Mr Zagórski, to proclaim the date of death of Dr. Rauni Luukanen-Kilde, International Day Against Mind Control. You have liked the idea and 8th of February is coming soon, so it’s time to put it into life and pay back the moral debt to her, who made so much for the TI’s movement. On this occasion STOPZET association together with the internet televisions: Swedish – WHITE TV and Polish – NTV propose to all the TIs’ of the world and their allies to take part in the common medial event. Our aim is to proclaim the International Day Against Mind Control, to pay tribute to Dr. Kilde and to broadcast most widely via Internet the information about necessity of immediate prohibition of inventing, testing, producing and using the newest generation weapons that can remotely control human behavior. 1) To the Polish Parliament about the prohibition of testing those weapons on the Polish citizens and about setting up the special parliamentarian committee to research the issue of secret EU and NATO experiments that were undertaken on us in this matter. We plan at least 3 hours long program block. Our guests in studio will be Mojmir Babacek and Dr. Henning Witte that you know from Berlin, but we also count on the presence of the other TI friends on Skype or by video. The first hour will be devoted to Dr. Kilde’s memory and the necessity of lobbying for the prohibition of weapons remotely influencing human beings’ nervous system. The second hour will be filled up with the statements of the victims of secret harassing from Poland and from all over the world. We ask the representatives of national groups for a short video recording (2-3 min) about the situation of TIs in a relevant country. If there are a few associations in a country, we ask each of them to introduce itself, give the number of members, estimated number of victims of mind control, if it is known, as well as briefly mentioned the most important issues and initiatives. Please send us the recorded video till 5 february into the following address wdr@otn.com.pl by WE TRANSFER. The point is to make other Internet users aware of global scale of the problem and the fact that it may happen to themselves at any time as well. In addition, we would like the decision-makers and persecutors realize that their victims start organising themselves and demanding the compensation. You need not expose your personal details or the face if you don’t want. However a tongue of the transmission i.e. English is a crucial element, because the entire meeting and all video materials are live broadcast online, repeated in the evening program. Later it will be put on YT on the special Playlist. In the case your English was a barrier, please record yourself in your mother tongue and provide the recording with English subtitles. We also want to invite the politicians and journalists, who feel displeasure of the violence applied towards us and would like to hurry with help. They will be invited into the studio in person as well as virtually (via Skype). If you know such people in your countries, ask them to support our event with the brief presentation on video. Best in English, and if it is impossible, then with translation in subtitles into English. A few words will literally be enough in a style like this: My name is, I am representing …, I am supporting etc. TI – for groups and associations of Tis, JOURNALIST, POLITICIAN or DIFFERENT. We are waiting for your recordings till 4 February and this deadline is intransigent. At last, we will open a special page for private persons or organizations, which would like to express their support for the movement of TIs. An e-mail address, a full name or a name will be enough for an organization. You will get relevant links and materials soon and we ask- let us do it together. It is only a small pace and marathon is in front of us, but it is necessary to start one day. Jointly and definitely. See you in NTV! This entry was posted in biomedical research, Clandestine, Covert Assaults, covert harassment, covert implants, covert surveillance, electronic harassment, electronic surveillance, EMF Radiation/Sonic Neuroweapons, Human Subject Experimentation, neuroweaponry, New World Order, RFID Chips, Waking Up and tagged covert harassment, Deutschland, Dr. Rauni Luukanen-Kilde, Europa, Feb 8, International Day Against Mind Control, Microchips, mind control, NTV, Poland, rol. Bookmark the permalink.